If you are looking for a free way to direct customers to a page with your information on it, then a Facebook page is the way to go. These pages can have a wall, photos, videos, notes, likes and much more (like an insights tool that helps you measure the traffic on your site). Not only can people see what you are about, but they can see if their friends like you too! That little “like” button can be your best friend, and once you have accumulated at least 25 “likes” you can designate your page with a marketable and appropriate username and advertise that you are www.facebook.com/yourbusinessname. But what if you have a restaurant and you want people to know that their friends don’t just “like” your place, but are actually eating there? That’s when that button turns into the button and boom!…free word of mouth advertising via Facebook (as previously blogged by our founder and lead strategist Jeremy). If a person has 500 friends and even a few of them have checked into the same place, it lends credence to the awesomeness of your business. Say I want to check in to your establishment—well, um, it isn’t coming up on a nearby search. Why? Because you’ve got to have a place page for a customer to check in to your business—whether it is a restaurant or a doctor’s office (though probably not many people check into the gyno). It only takes one check-in to make sure you show up in a local search. You need to actually be at the location to create the place page, or have someone do it for you, then you edit the content and upload photos and give it pizazz. This feature works for you in a couple of ways: not only can people see their friends checking in to your place, but if they are nearby and searching for the place at which they want to check in, your listing will pop up as an option when they might not have otherwise known you existed. Once one person has “checked-in” and created your listing for you (or you did it yourself), you can go claim it and edit it to your heart’s desire. Then, once you’ve claimed and edited the pages you should merge them and make a giant, amazing super-listing. 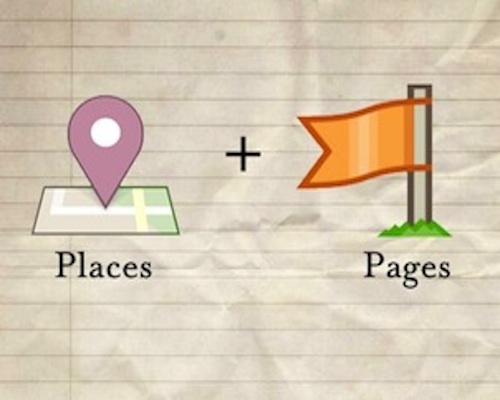 Then you’ll have all the likes and info from your original page and the check-ins from your place page. The pages can only be merged once you have claimed them as yours, so be sure to follow the claiming process carefully to get verified. 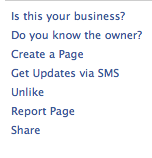 You will need a business phone number that Facebook will use to call and verify your business. I saved the best for last! 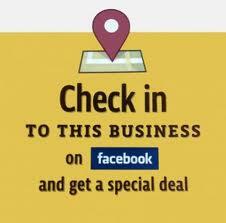 Facebook has given you a way to give your customers kickbacks in the form of Facebook check-in deals, which are redeemed when a customer “checks in” to your establishment. When a person “searches nearby” for a business, a little yellow ticket will be next to the listing if a check-in deal is offered. Whether it is a free drink or some percentage off a service, you will keep regular customers happy and pique the interest of new customers. Putting this on your website or even as a flyer in your storefront window will help you gain and keep customers. The first one of these bad boys I saw was taped to the back of a bathroom stall in a restaurant, but it definitely got my attention as a consumer and I checked in right away to get my deal. So make sure your pages and places are one and the same to avoid confusion, then get yourself a check-in deal to reel ’em in and get yourself some free advertisement. And be sure to send us a link so we can reap the benefits —er, I mean post about your successes! UPDATE! 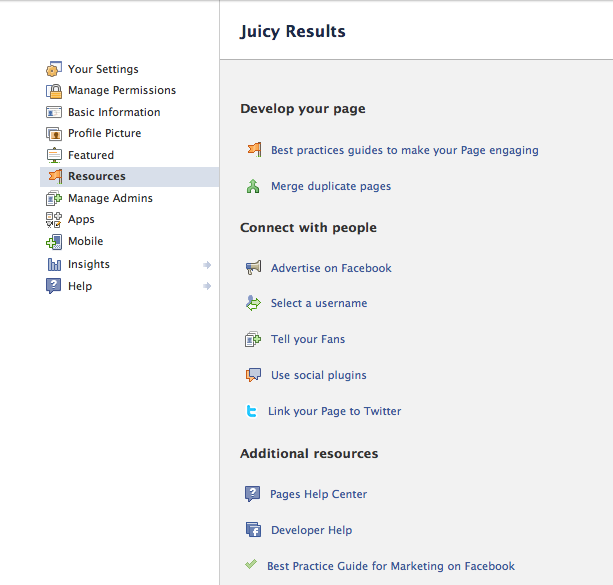 The Facebook for developer’s page will tell you that you go to “Edit profile > Resources > Merge duplicates”, but the merge option only shows up once you’ve claimed both pages, are an admin of both of them and the address and phone number match. When you’ve claimed them both you can merge them and Facebook will simply delete the duplicate listing with fewer ‘likes’. Check our page out! Glad I found this, you’re defenitly a lot more clear than facebook is! Got it fixed in under two minutes, nice writing style by the way!